Born in Kingsburg, California in 1923, Earl was the son of a schoolteacher and a building contractor. He aspired at an early age to artistic enterprises, among them collecting stamps and making the books to place them in. It could be that the stamps of the exotic countries inspired him to travel the world, which he did whenever possible. Growing up in San Francisco, Earl attended Mission High and then City College. This is where he began his formal art training. He then attended the University of California at Berkeley for a year and a half, studying under such instructors as Eugene Neuhaus and John Haley. World War II interrupted his studies when he signed up with the U.S. Navy. Graduating from the Naval Academy, he became an officer on the LSM 314, a landing ship that traveled throughout the South Pacific; especially the Philippines. In addition to his duties of navigation, communications, and gunnery officer he continued to sketch, paint, and write about the scenes and events around him. Following the war, Earl resigned his commission from the Navy and returned to his hometown of San Francisco. Using the G.I. Bill, he attended the San Francisco Art Institute and the Academy of Art, studying with many of the well known artists of the day, such as Richard Diebenhorn. Earl remembered one of his teachers, Thomas Leighton, saying while twirling his giant red moustache, “If you can draw the figure, you can draw anything”. Earl, being a serious student of art took those words to heart, ever honing his drawing skills until cancer took his life at the age of 79. In 1947, Earl married Janet Behr, his sweetheart from San Francisco. Soon he became a father of two children - Kristie and Wesley. In order to provide for his family he went to work as an apprentice illustrator for Patterson & Hall, a service furnishing art to advertising agencies. From there, he moved to the San Francisco Examiner as a staff artist. Moving forward he then graduated to Landphere & Associates advertising agency as an illustrator. While employed in advertising he continued his work as a fine artist in the studio he built at the top of his Moraga Street house. In 1960, Earl was able to become a freelance artist working entirely from his home studio. Representatives from New York, Chicago, and Los Angeles provided commercial assignments that led to a lucrative career. These commissions allowed him to spend more time on his fine art aspirations, plus the bonus of being home for his wife and children. Since travel was a huge interest of Earl’s, he creatively combined his art, travel, and continued financial stability, by developing his talent as an “on the spot” artist. This led to clients sending him to the actual scene needed for an advertisement. He could be found sketching 700 feet below ground in a Texas salt mine, or sitting on a dock in the Orient drawing the ships in port for a calendar. Drawing on location became his favorite way to work. The ability to sketch anything on the spot served him in good stead when, in 1974 he began to travel specifically to draw and do so without the support of commercial assignments. Later on, many of his trips were funded by a San Francisco based travel agency who, realizing his talents not only as an artist but as a group leader, sponsored his travel by having him lead other aspiring artists to the “backroads” of foreign lands. In all, Earl visited and drew in over 71 countries around the globe. The sketches from these trips would later inspire paintings done in his studio at home. He also became well known for his American journeys through his original Sunset book “The Backroads of California” and later on for his additional “Backroads” books which included travels through Oregon, Washington, Arizona, New England, Texas, and the Carolinas. Happily, in 1964, Earl and his family acquired a country home five miles outside the Napa Valley town of Calistoga. This became their permanent home in 1969, where much of Earl’s work was done in a spacious studio built in amongst the trees he loved so much. 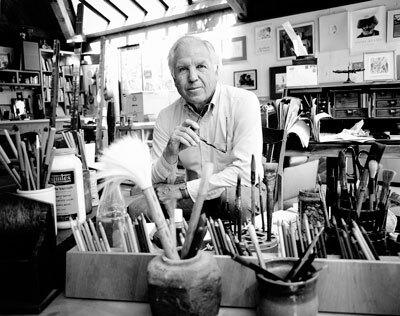 He became and remains famous for his many pen and ink drawings of Mount Saint Helena, the vineyards and the structures of the Napa Valley. During his career, Earl illustrated over 62 children’s, cooking and travel books. He produced at least 60 one-man showings and participated in countless group and invitational shows. This tireless productivity and focus are a tribute to his insatiable curiosity, love of learning, life and the recording of it through his art.